In the spring of 1849, Capt. Augustus Hill Chandler Sr., along with his wife Polly and their son Col. John Wilkes Chandler and his family from New Hampshire, arrived in Waupaca County in search of land to claim. They settled along the Waupaca River in what became the Towns of Waupaca and Lind. Their settlement became known as the "Chandler Settlement" and today is near the Waupaca Municipal Airport. A few weeks later, in June of 1849, five settlers from Vermont arrived and staked claims two miles west in what would become the city of Waupaca. This group included E.C. Sessions, Martin Burnham, William and Joseph Hibbard and William Pratt. The five men started out on foot from Sheboygan looking for "Indian Lands" that had been made available for settlement following a federal treaty with the Menominee tribe in 1848. The Vermonters traveled along Lake Winnebago and then onto the current location of the village of Weyauwega. There they heard about the clear Waupaca River and its falls. Following Indian trails, the men traveled to "the falls," claiming land in the area now known as North Main Street. Other settlers soon followed, and the growth of the young village was steady. Mills were built along the Waupaca and Crystal Rivers as early as 1849. In 1851, a Post Office was established and the settlement at "The Falls" was officially named Waupaca. The first businesses were flour mills, lumber mills and general stores. Voters decided to establish Waupaca as the county seat and a courthouse was built. 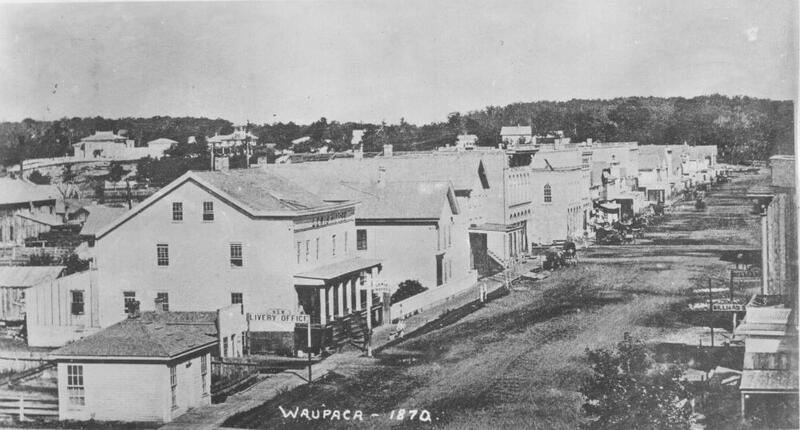 The village of Waupaca was incorporated on May 4, 1857. Many new businesses started, and many new settlers came, all contributing to the growth of the city. Railroad tracks were laid, and the first train arrived in Waupaca on Sept. 28, 1871. The railroad brought new opportunities for commerce and growth. In the early 1900s, tourism began to grow in the area, and many hotels and lodges were established in the city of Waupaca and along the Chain O' Lakes. An electric trolley line was completed to transport tourists from the city of Waupaca out to the Chain O' Lakes resorts in the early 1900s. In the mid-1900s, industry in Waupaca grew, with companies such as the Madison Silo Company, Cary Manufacturing and the Waupaca Foundry being established. Waupaca has changed through the years, but the community continues to grow and prosper around the river and lakes that initially drew its first settlers.